Poet's Notes: I have never had a car payment, which might say something about my financial conservatism, or it might say something about the cars I've owned. 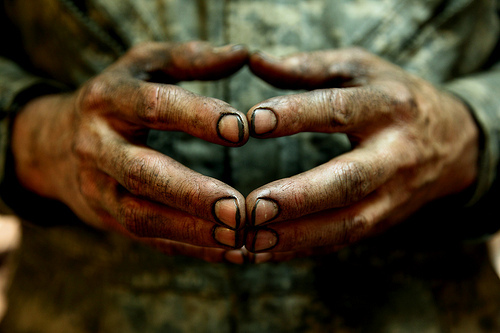 Dismantling the naïveté of modern existence where every problem is solved for a price, I work to keep my hands dirty. Human ingenuity goes to bed. And sleeps. Landfills full of broken bits praying for mending in a divided, divisive world separated by chasms not even the rope bridge of San Luis Rey might span. Unless we let it. Unless we weave those damn ropes ourselves. Ink stained palms, oil on new pants, mud caked onto shoes. Calluses cracked as sweat runs in steams in dry gullies of $9.95 replacement parts.